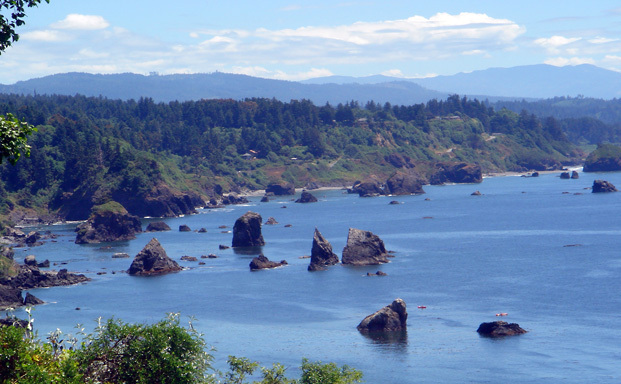 Trinidad, California - Trinidad Tourism Lodging Association, where the redwoods meet the sea, North Coast, Humboldt, California, 95570"
Nature at its finest. Nature at its purist. Nature at its wildest. Explore seriously stunning beaches, a sparkling little harbor, and strikingly scenic trails in serene parks. 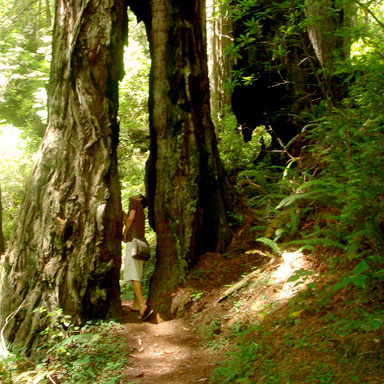 Revel in sacred redwoods. After sight-seeing all day, you'll be dazzled with spectacular sunsets. . Touring, hiking, and surfing will certainly make you hungry. Charter a boat and catch some salmon, or borrow a crab-pot and crack a few. Doesn't get any fresher. Maybe just relax with some chowder and smoked salmon while checking out the scene at the pier? Offshore, you'll spot seabirds, whales, seals, and kayakers, fishermen and our famous statuesque sea stacks. These stacks are part of the California Coastal National Monument, and we're honored to be a Gateway City for viewing it. . Trinidad is a city? With less than 300 people? 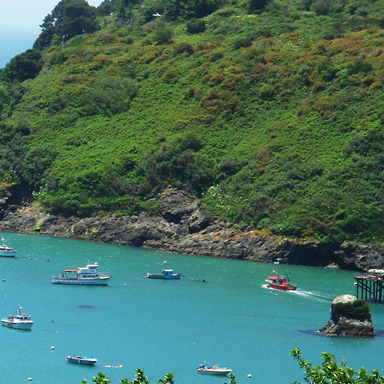 Trinidad is one of the oldest, smallest, and most westerly cities in California. Learn more about our City and our Greater Trinidad Area in tourAbout Trinidad. Visit us, and we're sure you'll want to play, work, and live in Trinidad too. . So come discover the naturally peaceful uniqueness of our historic little fishing village. See why some keep Trinidad their secret, and we proudly share it with you. Trinidad visitors return year after year and the happiest of them stay a lifetime. Eons-old, the world's tallest trees are here. Still a youngster at 600, Hyperion stands over 379 feet tall! How high will he grow in the next 1000 years? Coastal Redwoods meet the sea in two unique environments - Trinidad's and in Big Basin near Santa Cruz. Besides sand, surf, sea and trees, we're lucky to have the majestic Trinity Alps as great neighbors. These mountains are unrivaled in both their beauty and solitude. Though the second largest Wilderness in California, this is still no drive-in park. You'll need the fortitude of a grizzly to tackle this park's trails - plan on backpacking for a couple of days. For auto-touring, Lassen Volcanic National Park is a few hours east of the Alps and a must see with its hissing fumaroles and boiling mud pots. How'd you hear about Trinidad? What would you like help with? 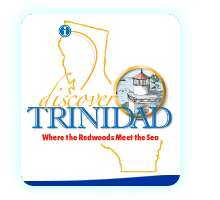 It was tuff to choose, but the Chamber chose a winner in their "reDiscover Trinidad" Story Contest. We're hosting these stories of discovering Trinidad in a picture gallery. Read their stories, then share yours! 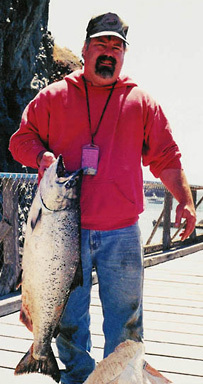 Hire our local charters and plan your fishing trip today! Museum 99% finished! It's come a long way. They've started a new Web site TrinidadMuseum.org and a blog. The Library continues fundraising and also has a new site TrinidadLibrary.org. We're getting a geothermal heating system donated for it too - very cool. Our Library will be open all summer with lots of fun programs. Find more info on Library programs here. Welcome Visitors - Time to Play! First You Have to Get Here! Whether you're here for an hour, a day, a week, or a lifetime, we know you'll enjoy your Trinidad visit. Many discover Trinidad on a road trip. U.S. 101 is one of the original U.S. Routes established in 1926. It's also the most western and one of the longest U.S. Routes. In California, northern 101 is called the Redwood Highway. It is spectacularly scenic north and south from Trinidad. 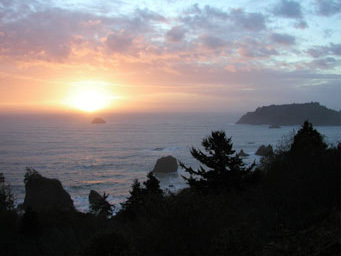 Trinidad's exit is at Humboldt County postmile marker #101. OK You're Here, So Now What? Our Tourism Web pages will help you plan your Discover Trinidad visit. Grouped along with links to our Chamber of Commerce, they will help you find all kinds of helpful places and people in our community. Not only will you find lodging, dining, and shopping, but we've also listed community organizations and service providers, and fun fishing charters. Remember, Trinidad Visitors return year after year and the happiest of them stay a lifetime. Conservative drive times: Portland 8hr, San Francisco 6hr, Sacramento 6hr, Grants Pass 3hr, Redding 3hr, Mendocino 4hr. If you have time, take the coastal way to San Francisco - State Route 1. It starts south of us at Leggett where there's a drive-thru tree opportunity. 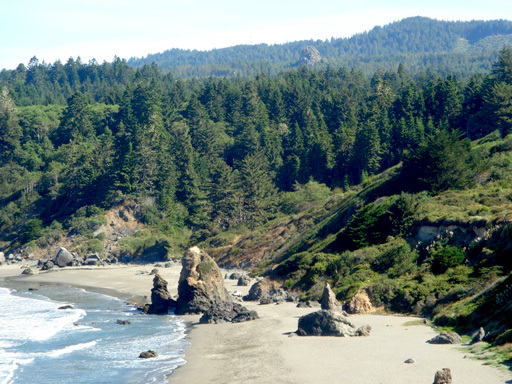 Wind through a redwood forest and pop out dramatically on the Coast. After Fort Bragg and Mendocino, there are opportunities to cut back to U.S. 101, but know you'll be missing some charming coastal towns. There are special Pinot Noir Wineries and Bahl Hornin' (good drinking in Bootling) at Beer Festivals along SR 128 in Anderson Valley ( AndersonValleyChamber.com ). If you make it all the way, don't miss the funky little town Bolinas at the southern tip of Point Reyes National Seashore. They frequently pull the sign down to keep it secret and avoid discovery. After Stinson and Muir Beach, SR 1 rejoins 101 close to Sausalito, and shares it on the Golden Gate to San Francisco. The Greater Trinidad Chamber of Commerce is as unique as Trinidad is itself. Local business owners you'd expect to see in a Chamber of Commerce join with a special group of enthusiastic supporters - their individual members. Working together, donating innumerable volunteer hours, the Chamber helps preserve the traditions and charm of Trinidad. Supporting our local businesses and organizations, they proudly share not only our charming City, but also the beautiful Greater Trinidad Area surrounding it. The Chamber and event sponsors put on many traditional annual events and dinners. Besides being fun for all, these events fund Chamber projects and provide contributions to local organizations. 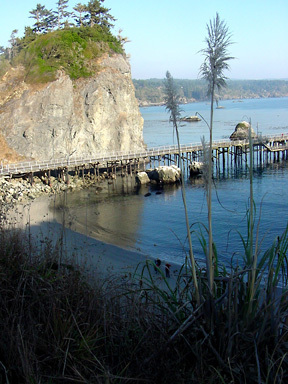 Our largest events are the Trinidad to Clam Beach Run and the Trinidad Fish Festival. Profits support the Chamber and annual scholarship funds. Their Academic Excellence Award goes to qualifying seniors, graduating from local high schools, who attended Trinidad Union Elementary School or Big Lagoon Elementary. Our Trinidad School Math Award is presented to an 8th grade math wiz graduating from Trinidad School, and our Higher Education Grant is open to Chamber Members and their families seeking vocational or adult training. In addition to events and scholarships, they continue to publish the "Discover Trinidad" brochures locally. With a Greater Trinidad Area Map and a City Map close-up, the brochure is a helpful resource for Trinidad Visitor Information. 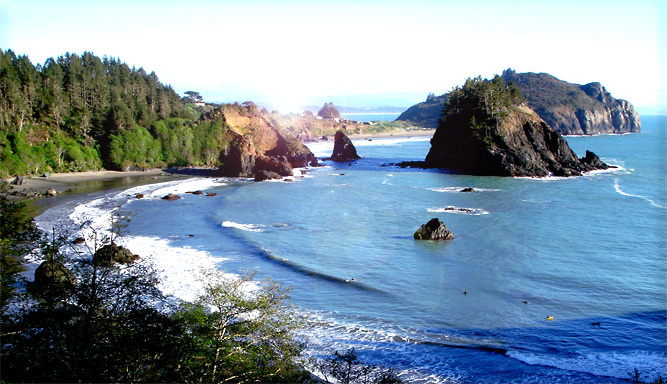 Working with the Humboldt County Convention & Visitors Bureau they advocate responsible tourism and encourage visitors to "stay another day" in Humboldt County. New and prospective Trinidad Residents, please contact our Chamber office at your convenience. See our Visitor Guide in the playVisitors area. It has lots of resources for you. We're looking forward to meeting you, and helping you get settled. Congratulations on your discovery and welcome home!